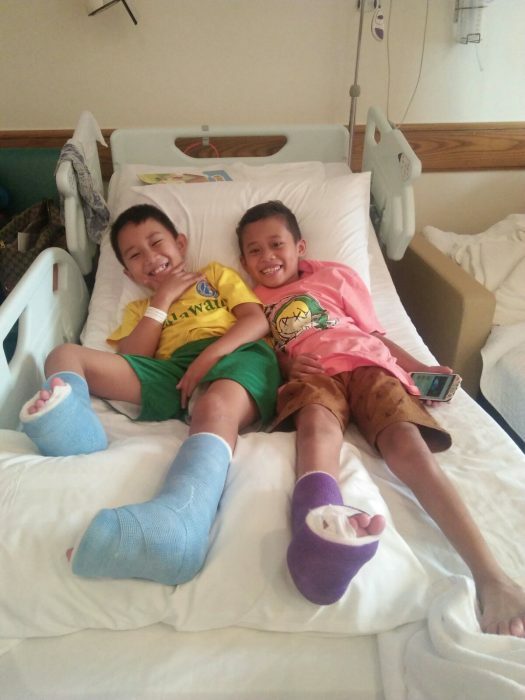 Dennis Kyle and Wen Heart come from very different parts of the Philippines but were brought together in Hong Kong to receive surgery for clubfoot. The boys have a lot in common, from their interest in soccer to their experiences with bullies. As a child, Dennis Kyle was called “bali paa” or “twisted foot” by his classmates. Wen Heart was also bullied, being pushed down and laughed at by others. Both boys eagerly looked forward to the day they could walk and run properly. Thanks to some generous donors, Dennis Kyle and Wen Heart were brought to Hong Kong on May 1st to have surgery at Matilda International Hospital. The brave little boys were excited, looking forward to the day their feet would be corrected, giving them a new beginning. Dennis Kyle had surgery first, and the following day was Wen Heart’s turn. Both surgeries went smoothly, and their parents were relieved when their children emerged from the operating room hours later. The anesthesia slowly faded, leading to sleepless nights and excruciating pain. Though in pain, Dennis Kyle and Wen Heart both fought a good fight. Now they’re recovering well, and the smiles have returned to their lovely faces. Right now they spend a lot of time resting at the hospital. They’re scheduled to go back to Philippines on May 14th, and they will return in two or three months for further rehabilitation and medication. We’re thrilled that these boys have been given a new lease on life. They have a chance to learn, play and dream dreams like any other little boy. Wen Heart hopes to become a policeman while Dennis wants to be a professional soccer player. With this surgery, there’s a chance their dreams could one day become a reality.